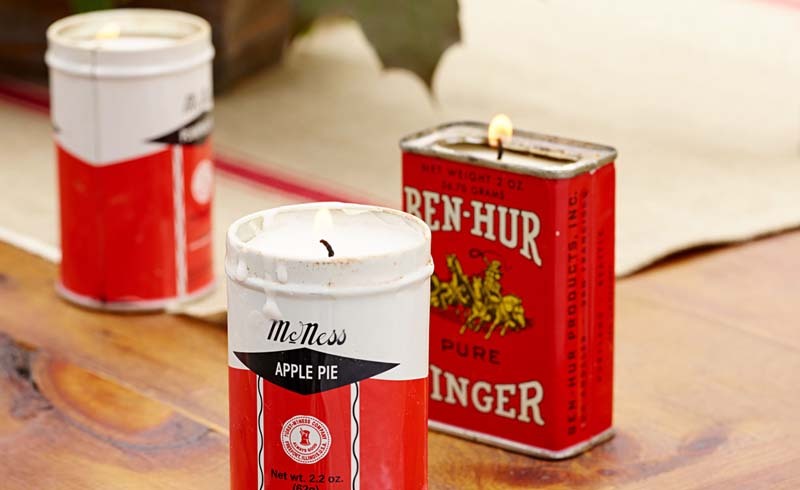 A little DIY turns vintage spice tins into clever candle holders for your autumn party table. 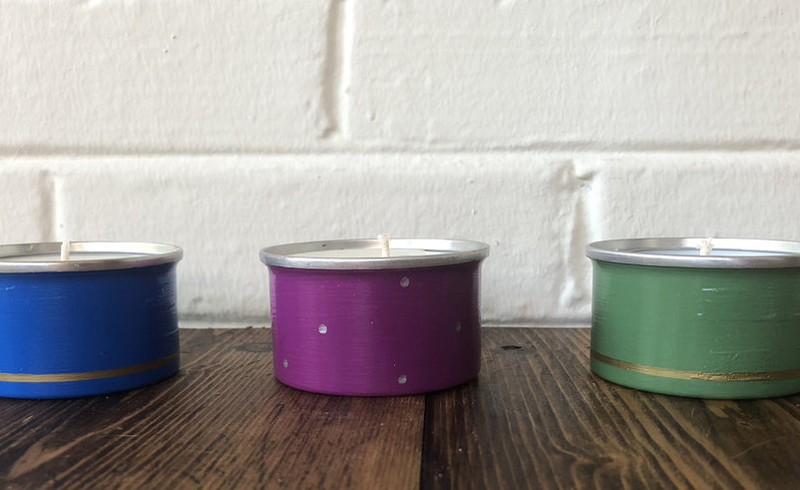 Here's what you need to know to make candle holders out of vintage spice tins. 1. Clean and dry your spice tins. Use wax adhesive to stick the metal discs at the bases of your wicks to the bottoms of your spice tins. Place your tins on the foil-lined baking tray. 2. Use two skewers or chopsticks rubberbanded together to flank the top of each wick to keep it centered during wax pouring and cooling. 3. Fill the saucepan halfway with water and place it over medium heat. Place the pouring container in the pan and add flaked wax (as much as you think you’ll need to fill your tins) and the thermometer. For safety, it is very important that you know the pouring temp of your wax along with the melting point and flash point (temperature at which wax will ignite) and watch the temperature carefully. 4. Once your wax reaches the pouring temp, carefully remove the pouring container from stove and pour wax into each tin. Stop pouring between ¼ and ½ inch from the top of the tin. 5. Leave your tins on the tray to cool. Once the wax is completely cool and opaque (this might take up to an hour), trim the wick and burn.